“The ETH spin-off GratXray is working to improve precision in mammography. With the help of an innovative new device, breast cancer detection might not only become more accurate, but also painless. This is a revolutionary step in breast screening. Every start-up begins with a vision of conquering the market with new ideas, but a number of milestones must first be reached before the successful founding of a company. This was the case for GratXray, a spin-off that grew out of ETH Zurich and the Paul-Scherrer Institute (PSI) this summer. “There’s a fairly long story behind the founding of GratXray,” says Marco Stampanoni, co-founder of the spin-off and professor of X-ray imaging at ETH Zurich. The scientists laid the foundation for their company between 2006 and 2017, during which time they worked consistently on the further development of X-ray phase contrast mammography. By integrating three gratings into conventional X-ray systems, it became possible not only to measure how strongly the tissue absorbs the X-rays, but also how X-rays are refracted and scattered. The additional information gained in the process produces extremely high-contrast images, making it possible to visualise even the finest tissue structures. This makes it easier to reach conclusions about the state of the tissue examined and detect signs of breast cancer, such as micro-calcifications, at an early stage. “Thanks to this approach, based on grating interferometry, we have taken an important step towards clinical application,” says Stampanoni. In addition, GratXray has already made a name for itself. The spin-off recently won the Swiss Technology Award. With the founding of GratXray, more than ten years of expertise are now being channelled into the development of a new type of mammography device. “In order to attempt this step, I had to be able to rely on the help of my founding partners, whom I fully trust,” says Stampanoni. He found such a partner in his long-time colleague Zhentian Wang, who as CTO is now in charge of the technical implementation. Stampanoni was also able to get Martin Stauber, a former doctoral colleague from the Institute for Biomedical Engineering at ETH Zurich, on board for this project. Stauber, who is now CEO of the spin-off, is convinced of the medical necessity of the new method: “Conventional breast screening methods are unsatisfactory and often lead to false or ambiguous diagnoses.” For example, eight out of ten women unnecessarily undergo a biopsy because current mammograms are too inaccurate, putting a great deal of psychological stress on the patient. Even more, state-of-the-art mammograms are painful for woman, as the breast must be strongly compressed to capture a good image. 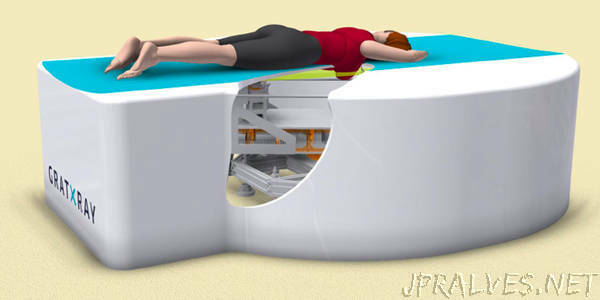 GratXray’s new method makes it possible to scan a patient while they are laying prone on a bed. The breast is guided through an opening in the examination table and x-rayed with a computer tomography device mounted under the table, making this type of mammography painless. The radiation dose will be the same as that of conventional mammography, but grating interferometry will yield high-resolution, high-contrast 3D images.